The Wild Wizards slots machine has five reels and 25 pay lines. Realtime Gaming (RTG) casino software powers this video slot released in 2014. Wild Wizards game can be played for real money as well as the Bitcoin (BTC) virtual currency on the Internet with no download, on your computer by downloading the software and on mobile Smartphones and tablets. 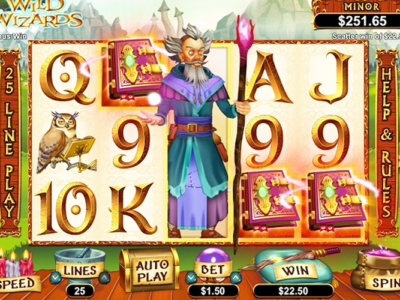 Check out the article on Realtime Gaming Releases Wild Wizards Online Slot Machine. The Wild Wizards online slots game has a large betting range to accommodate penny slot players as well as high rollers that play mobile casino games for high stakes. You can bet anywhere from twenty-five cents all the way up to one hundred twenty-five dollars per spin! 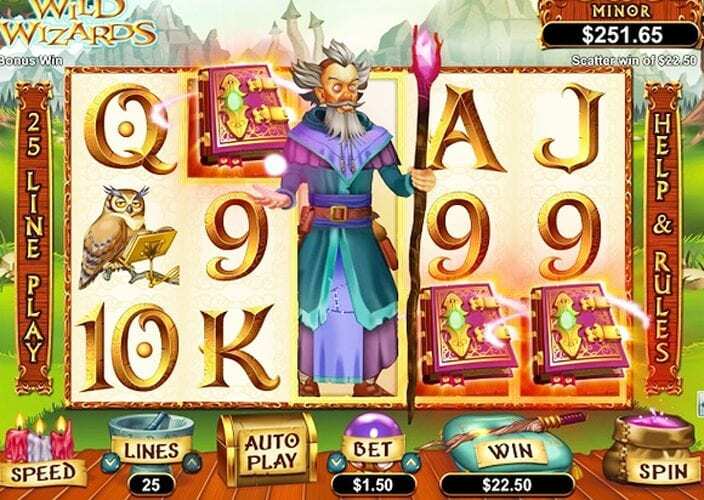 The “Wild Wizards” video slot machine game has an excellent amount of features to help you increase your winnings in addition to the progressive jackpot that triggers at random. The features include the Fireball Feature, the Polymorph Feature, the Wizard’s Tower Feature and the Mad Magic Feature. The two symbols to keep your eyes peeled for are the wild and the scatter symbol like in any casino slot game. The Wild Wizard icon is the wild symbol and will appear on all of the reels except the first and the fifth reel. It is an expanding while symbol, and when you land it you are in store for some beautiful graphics! Once the reels have expanded the “Wild Wizards” wild symbol will start to substitute for all of the other icons, which helps players by helping you form winning combinations, which increases your chance to win more cash or Bitcoin (BTC) virtual currency. The Book of Spells icon is the Scatter Symbol, which is an important symbol in the casino slot game and appears on all five of the reels! You simply need three scatter symbols to create a winning combination however when you land five of the scatter icons you win big! When you land the scatter symbols on the reels, you will trigger the multiplier that can increase your winnings by fifty times from your triggering bet. The bonus features are excellent, and one of the ways you can trigger the bonus game is by landing a scatter spell symbol in the first reel as well as a wild Wizard icon on the last reel at the same time. Once you land a scatter spell symbol in the first reel as well as a wild Wizard icon on the last reel at the same time rewarded the Fireball Feature, the Polymorph Feature, or the Sorcery Feature, the Wizard’s Tower Feature or the Mad Magic Feature.